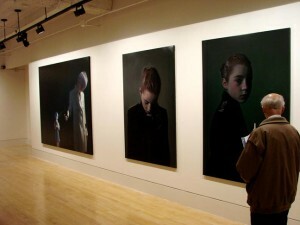 The works of Helnwein are vibrant, gut-reaction-provoking, and can both stand alone or be considered as a storyboard ensemble. The doll-like girl posing through the frames blurs the boundaries between reality and fiction, documentary and anime. The situations presented also blur the lines of a novelistic storyline which could form in the viewer's mind: Who are these characters? Why are they interacting this way? Is this the end, or merely the beginning? Uniformly dark backgrounds make time and space disappear behind these characters, leaving a void where any attempt at resolution is destined to fail. Comment by AB: According to the literature, Gottfried Helnwein's haunting images are all about war, the brilliance being that he offers nothing for ideologues to get all partisaned about-- to either confirm or condemn their agendas-- the upshot being that no matter what anyone's stance on which war, they're inexorably compelled to confront the atrocity itself... and those who perpetrate it.